ONE of the elegant customs of a Japanese summer is the Tanabata festivals, which are held throughout the country on the 7th. The custom originated as a combination of Chinese and Japanese traditions. An ancient Chinese legend had it that the Weaver Star (Vega) and the Cowherd Star (Altair) were celestial lovers who could meet but once a year on the seventh night of the seventh lunar month. This became merged with a Japanese legend about the celestial weaving maiden Tanabatatsume, who made clothing for the gods. The festival was once upon a time observed by the Imperial Court. 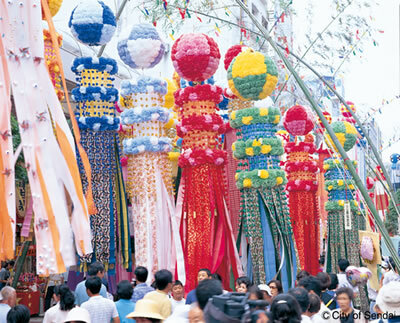 Most of the modern Tanabata festivals include a display of bamboo branches hung with strips of colored paper and other ornaments. People write their wishes or romantic requests on the paper before hanging them on the bamboo. These branches are displayed in many places, including municipal offices or medical clinics. But some of the festivals can be extravagant civic presentations. 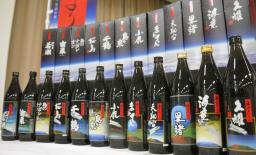 One was held in Sendai, the unofficial Tohoku capital, on Monday. In a region still recovering from the 11 March 2011 disaster, the theme of this year’s festival was wishes, hopes, and thanks. About two million people showed up, many of whom wrote and hung their wishes on 3,000 bamboo poles at 40 locations throughout the city. Here’s what part of it looked like. The city of Rikuzentakata in Iwate has a similar festival, but theirs is smaller. One reason is that it’s not as big as Sendai. 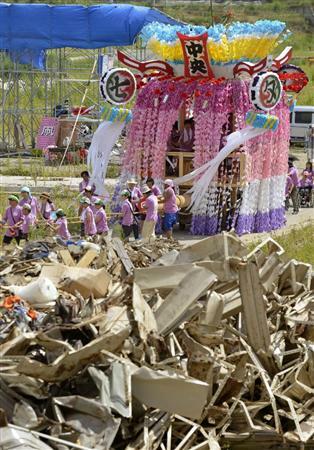 Another is that much of the city was washed away in last year’s tsunami, including some of the floats. And finally, staging the festival required that they work around the debris that hasn’t been incinerated or otherwise disposed. But there’s more to the story. With a Japanese festival, there’s always more to the story. In addition to the decorative float parade, they have what’s called the Kenka Tanabata, or Fighting Tanabata. The primary attraction at many matsuri is physical competition. Some involve teams, with mikoshi (portable Shinto shrines) or floats used as part of the weaponry. The participants are dead serious and play to win. The original idea is that the divinities will have favored the winning team, whose neighborhood or group will then enjoy good fortune, good health, a good crop, or a good catch of fish in the coming year. That doesn’t seem to have been the original idea in Rikuzentakata, however. The city had four fighting floats that were elaborately decorated behemoths. Two platform levels were built on the base of the four-ton bruisers, and children played flutes and taiko drums on one level during the parades. Sometime around 900 years ago, give or take a decade, the four main districts in the city built one each, and teams from each district pulled them on ropes through the city as part of the festivities. But the floats were too large to pass each other side by side in the narrow city streets. So they did what comes naturally — they started having contests in which the two teams would ram their floats into each other. The team that tipped the front wheels of the other float into the air was the winner. As is often the custom with Japanese festivals, onlookers are free to join the fray spontaneously on the side of the team representing their neighborhood, or for any other reason they come up with in the excitement or the intoxication of the moment. Last year, however, the tsunami washed away three of the four floats. The Rikuzentakatans had to console themselves with pulling the last remaining one through town with ropes. Tanabata in the city last year must have been a real drag. This year, however, contributions from around the country enabled them to build a new float, which meant they could resume their 900-year-old tradition, demonstrate their civic pride, and celebrate their recovery by smashing into each other again! But ain’t nobody slinkin’ off nowhere in this country that I can see. At that same time that article appeared, the residents of a city that was almost flooded off the map were back parading among the rubble and float smashing with some help from the rest of the country. Now, I could be wrong about the innate national resiliency (and really, the innate resiliency of all people everywhere). The climax of the Kenka Tanabata is staged at night and the floats are illuminated, but here’s a brief scene of what it looked like in the daytime a few years ago. It takes a few seconds for the sound to kick in. CHRISTMAS customs in East Asia may lack the self-perpetuating momentum of the holiday in Christian countries in the West with a longer tradition, but the season and its symbols can still generate intense emotion in this part of the world. An example is the the steel towers decorated as Christmas trees that an evangelical group erects every year two miles from the North Korean border on the 100-foot-high Aegibong Hill. They were to have been illuminated on Friday, which would have made them visible to soldiers on the northern side of the border and residents of the North Korean city of Kaesong. The decorations have caused periodic friction between the two countries — Bah, humbug might well be the North Korean national motto — and so were stopped in 2004. The group resumed the practice in 2010, but this year the Scrooges in Pyeongyang said they’d shoot out the lights and it would be the southerners’ fault if they did. Since no one has any idea of the leadership’s current state of mind up north, or even who constitutes the leadership, the South Koreans decided discretion was the better part of holiday virtue and will refrain from flipping the switch on the towers this week. 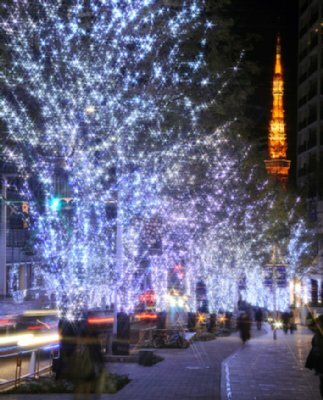 Fortunately, there’s a lot more peace on the Japanese part of the earth, and they can and do light all the Christmas trees they want anywhere they feel like it. 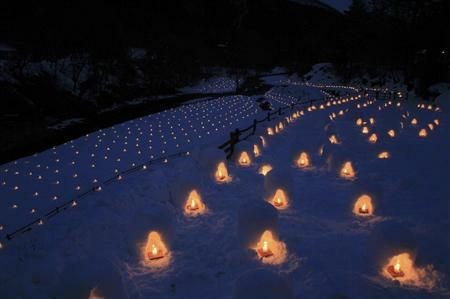 The Japanese view Christmas as an excellent opportunity to stage a festival of light. Indeed, with all the imagination incorporated into the designs, their variations on the theme of tannenbaum might be considered a minor form of public art. Here are some of the best in 2011. They’ve been partying since 13 November at the Aqua Christmas 2011 festivities in Odaiba. 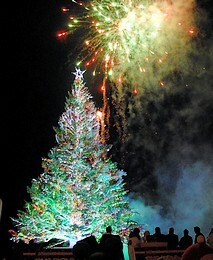 The sponsors have exhibited a seven-meter-high Marina Fantasy Tree that represents a Christmas tree rising out of the sea, which is a satisfying image for an island country. An added touch is that the colors change in coordination with the music. They’re just as abstract over at the Shinjuku Southern Terrace shopping facility. Inside the tower are two switches that change the lights from red to green to blue to a Christmasy pink to yellow to rainbow, accompanied by stately bell sounds. They’re calling it the Kizuna Tree, with kizuna being the human ties that bond, and they suggest it’s an excellent way for couples to strengthen their own ties. Christmas Eve is the big date night of the year in Japan, and if a young couple were to stop by to strengthen their ties at the Kizuna Tree and wound up buying something before they left, then so much the better. The cutbacks in power consumption necessitated by the Tohoku disaster forced people to use their imaginations and discover new ways to find the juice for the lights. The most frequently adopted solution is LEDs, but many places also use wind power, and some even went with vegetable oil. 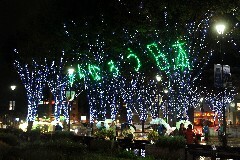 Wind power was the choice to light up a 400-meter stretch of zelkova trees in toney Roppongi Hills. It’s the first time they’ve trimmed the trees for Christmas in this neighborhood, so they decided to get creative with pink and beige lights designed to look like a waterfall. Those lights don’t look pink or beige, and they don’t resemble a waterfall either, but that’s what the copy said. Awareness of the Tohoku disaster is still fresh in everyone’s minds, and that’s why the trees displayed in the central concourse at the JR Ueno Station were decorated with ornaments made in the areas hardest hit in March. They were put together by women in Kuji and Rikuzentakata in Iwate, and Ishinomaki in Miyagi who were suddenly unemployed in the aftermath of the earthquake/tsunami. 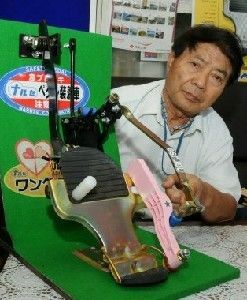 The operation was put together by a group in Saitama called Team Tomodachi to help those in the stricken areas. They asked the women to make the ornaments, which they then sold to remunerate them for their work. The material used was the leftovers from the process for manufacturing organic cotton products. The trees themselves were put up by Atre Ueno, a local shop, with the help of the Tokyo and Sendai branches of the East Japan Railway Co. and Ueno Station. Seven women from Ishinomaki came to Ueno in November to hang the ornaments with Atre Ueno employees. One of the women explained that she thought she wouldn’t be able to do it when someone approached her with the idea — she had spent her whole life processing wakame seaweed by hand, and crafts were not her hobby. The longer the group worked together, however, the more fun they had. She said that, on reflection, she lost a lot this year, but also wound up gaining something as well. A look at some of the posts under the Christmas tag for a peek at Christmases past will show that PET bottles are a favorite choice as a tree material substitute. All the trees along this pedestrian walkway near the municipal offices in Nantan, Kyoto, were made with the preformed polyethylene terephthlate. The members of a local club found about 3,500 empties, which surely left them with sticky fingers. They weren’t too sticky, however, to prevent them from putting together 30 1.8-meter trees of six levels with 30 bottles, and two 2.4-meter trees of eight levels with 500 bottles, and then lining them up along the 200-meter pathway. If you’re in the neighborhood and want to see for yourself, they’ll be lit until 8:00 p.m. tonight. 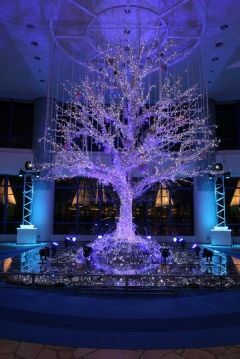 An executive committee consisting mostly of JCs got profligate with the LEDs a little further to the north in Tsukuba, Ibaraki, and used 200,000 to decorate a 200-meter-long row of zelkova trees at the city’s Tsuba Center square near the train station for the seventh year. This year, they wanted the display to reflect the wishes for national recovery, so the lights spell out Gambaro Nippon, or Let’s Fight, Japan. There’s another tree-based illuminated decoration at the Chuo Koen (Central Park) in the city. If you can’t make it there for Christmas, don’t worry — they’ll be up until 9 January, and that makes a few more than the standard 12 days of Christmas. 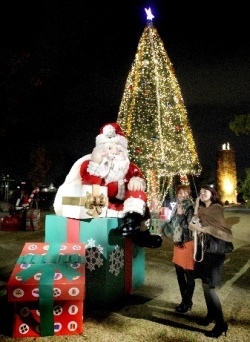 Santa will visit and a tree will be lit at the Noritake Garden, a ten-year-old park in Nagoya. Mr. Claus will again climb the chimney on the ceramics plant to plant a 12-meter-high tree there. The reduced supply of electricity this year caused by fallout from the Fukushima disaster will be offset by a solar power generator installed at the facility in October, capable of producing an average of 120 kW a day. Everybody likes Christmas surprises, so the Shinwa Construction Co. in Osaka has had a suprise for a different neighborhood every year for the past eight years. They use the front lot of whatever condominium that they happen to be in the process of building and put up a 12-meter-high Christmas tree with 30,000 LEDs with no warning on 1 December. Naturally, this keeps the Osakans wondering where the tree will turn up every year, and making a special trip to see when they find out. 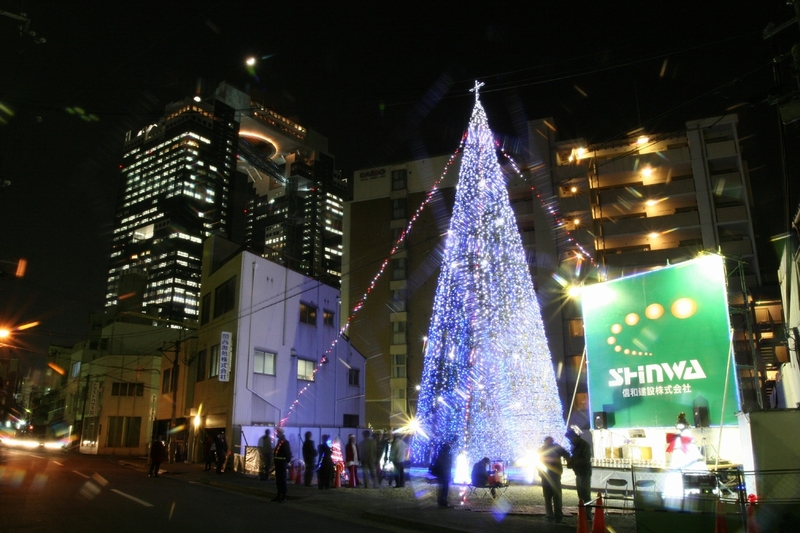 This year the tree was put up in Yodogawa Ward, but this photo shows one from about five years ago. The company also staged a “Christmas Event” on the 22nd and 23rd with an artificial snow machine and stalls selling such Yuletide delicacies as oden and yakitori roasted o’er an open fire. Not all that gllitters is an LED. The 10-meter-high tree put up by the Ukai Venetian Glass Museum in Hakone consists of 70,000 pieces of crystal glass, which flash in seven different colors in the sunlight. Though it’s illuminated externally at night, as you can see in the video, the tree itself has no internally lit ornaments. The facility also added 60 candles and 180 lanterns to the park exhibit on 1 December. The northern island of Hokkaido is cold enough to pass for the North Pole — they start wearing jackets at night at the end of August — so Christmas comes naturally to the natives. The city of Hakodate is also known for the big trees at its Hakodate Christmas Fantasy. It’s so well known, in fact, that the city of Hirosaki in the neighboring prefecture of Aomori put up their own 20-meter tree at the site. Hirosaki Mayor Kasai Noriyuki explained the display was to promote ties between the two cities. And hey, what’s Christmas without a fireworks display? 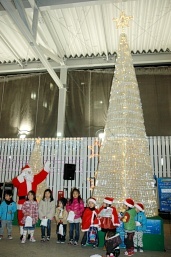 The Kagoshimanians also got into the Christmas spirit by making three trees out of PET bottles, which they displayed at a big shopping mall in the center of the city. 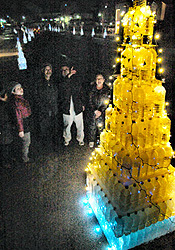 It’s the third year Yamagata-ya has put up PET bottle trees to enhance awareness of ecological activities and recycling. 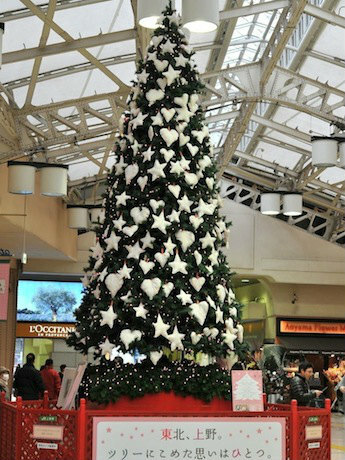 The main six-meter-high tree used about 2,800 bottles brought by customers and 6,500 LEDs provided by the store, and if you look behind the adult Santa in the photo, you can see one of the three smaller subsidiary trees. They got the store customers to help put them together and hang the decorations, which is a bit like Tom Sawyer getting his friends to paint the fence, though this was more fun and a lot less messy. Just looking at it cheers me up. After this difficult year with the disaster, these are lights of hope. They’ll be lit in their city until 11:00 p.m. tonight, and hopefully in their hearts for many more nights to come. The year I came to Japan there was a musical tsunami in the form of Yamashita Tatsuro’s soundtrack to the movie The Big Wave. It hit #2 on the charts, making it one of the most successful soundtrack records in Japan. It was especially popular among people in their 20s and 30s, both because it was so well done, and because Yamashita himself was a favorite among people of that age at the time. One half of the LP consisted of Yamashita’s tunes, and the other half of Beach Boy remakes that are more listenable than the originals, but then my taste lies in directions other than that of the Wilson brothers. He didn’t need any brothers for the harmonies because he overdubbed all the vocal parts himself. Yamashita is (or should be) in the top rank of international pop music auteurs. Asked about his musical inspiration, he said he grew up listening to FEN (Far East Network), the radio station for American servicemen in this part of the world, which anyone with a transistor radio in Tokyo can hear. The production values of his music also recall uptown soul music, so if you can imagine a Japanese singer creating original material that mixes Beach Boy and soul music influences, then you’re close to the Yamashita sound. Even better known than the original Big Wave LP is his Christas song, called Christmas Eve, which was released as a single the year before. It reached only #44 on the 1983 charts (the LP from which it came was #1), but it had miraculous staying power: it’s the only Japanese pop song to reach the Top 100 for 20 straight years. The single eventually sold 1.8 million copies, boosted by its use as the theme song for JR East’s seasonal commercials starting in 1986. The residuals alone must surely mean that all of his Christmases will be bright. HAS THERE ever been a sorrier crew to steer the ship of state than the Kan Cabinet? Besides the Hatoyama Cabinet, I mean. Democratic Party Secretary-General Okada Katsuya has now been reduced to apologizing to the opposition for the behavior of Prime Minister Kan Naoto. Mr. Okada understands that’s a thankless task. He’s already said in public that Mr. Kan is “the most difficult man” he’s ever worked with. He met yesterday with Ishihara Nobuteru and Inoue Yoshihisa, his counterparts in the LDP and New Komeito, and the Diet Affairs chairmen of all three parties. He told them he was sorry that the prime minister picked Hamada Kazuyuki, an obscure LDP upper house member, to serve as the internal affairs parliamentary secretary in charge of reconstruction. We’ve seen this several times before: It’s the sort of move Mr. Kan thinks is clever, but exasperates everyone else, including his own party. Specifically, he hopes to win their cooperation for passing the three bills Kan Naoto cites as his condition for resigning. Could it be that the prime minister has devised a new strategy for dealing with the legislature? Behave so obnoxiously the opposition will give you what you want just to be rid of you. How’s that for cautious understatement? Mr. Matsumoto was unable to get off on the good foot with the governors because he stuck both of them in his mouth. At the same time. As far as they would go. Nothing like that old “We’re all in this together” spirit to engender a sense of shared sacrifice and effort to recover from a national disaster, is there? If someone were of a mind to make excuses for the DPJ, he might suggest that Mr. Matsumoto intended to tell a joke at his own expense to make the inakappei feel at ease in the presence of one of the Big Enchiladas from the national government. That would have to be someone from overseas making the excuses, however. Most of the Japanese have stopped trying. You’ve heard of people with a tin ear? This guy’s got a tin tongue. By the end, he presumably meant the end of access to him. At least I hope that’s what he meant. They also reminded the government that they were not in a master-subordinate relationship with them. In other words, ask his boss, and that ain’t me. They finally did ask his boss, of course, and that was the sorriest part of the entire episode. 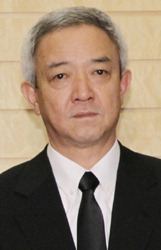 One reporter brought up the subject of Mr. Matsumoto with the prime minister at a news conference. Mr. Kan ignored the question. This morning Matsumoto Ryu resigned after nine days on the job. It wasn’t because he realized he had done anything wrong, mind you. He merely said that his comments might cause difficulties in Diet negotiations. When the Diet agreed to extend their session by 70 instead of 50 days, Mr. Kan excitedly told his aides that anything could happen in that time. Gov. Murai tried to be graceful about part of the situation. He said he thought the “off-record” comment was a joke. It might have been, but not in the sense that Mr. Murai meant it. THE SURVIVORS of the Tohoku earthquake/tsunami, as well as those residents near the Fukushima power plant forced to evacuate, must deal with the most basic of problems: securing food, clothing, and shelter. The immediate but temporary short-term solution to those problems is a matter of logistics. Resolving those problems will be difficult, but the difficulties lie in execution rather than conception. The disaster has also created more subtle problems that do not admit of easy answers. The degree of logistical efficiency is irrelevant, and there are no satisfactory short-term solutions, either temporary or permanent. Those problems are not one of the physical survival of people, but rather the survival of the physical symbols of cultural identity. Residents within a 30-kilometer radius of the Fukushima power plant have been evacuated from the area for an indefinite time. The people affiliated with and responsible for Shinto shrines in the evacuation zone are unsure whether they should take with them the physical objects representing the divinities in the shrines, known as shintai. This isn’t a trivial issue for the people involved. They believe the spirit of the divinity at the shrine resides in the physical object, and they also think those divinities have protected the area for many years. In the Japanese perspective, “many years” usually means “several centuries” and often means more than a millennium. 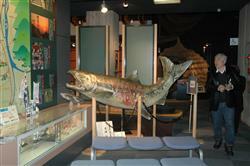 The association would prefer that the shintai not be moved. They understand that the evacuation could be for a long time, however, so say that preference must be given to local circumstances. Another factor is Article 81 of the law governing religious corporations, which applies to the entities responsible for both Shinto shrines and Buddhist temples. That law states the corporations are subject to dissolution if their facilities have been destroyed and they are unable to replace them for more than two years, unless there are extenuating circumstances. Common sense says that the extenuating circumstances are as plain as the nose on your face, but government bureaucracies are filled with people who develop visual impairments as a means to justify their existence. The Agency of Cultural Affairs, which has jurisdiction in the matter, says the extenuating circumstances clause could apply, but want to wait to make a final determination until after they conduct a survey. The local people say that’s unreasonable, and they want their institutions to be removed from consideration for dissolution now. The ramifications of this law could have an effect not only on the shrines and temples in the evacuation zone near Fukushima, but also on those in Iwate and Miyagi unaffected by the radiation because they (and the priests) disappeared in the tsunami. 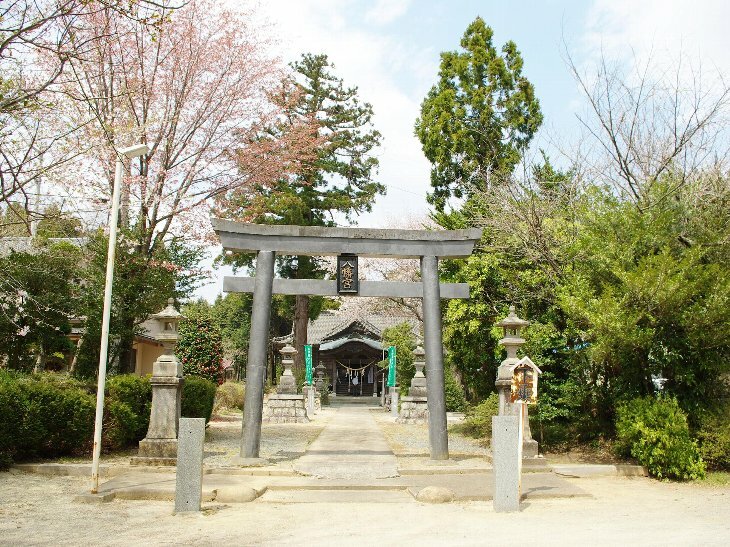 The problem at hand for the shrines near Fukushima involves the shintai, however. Some people think it would be best to have them stay and keep watch over the land while they’re away (they use the phrase rusuban in Japanese), but others think they should be evacuated with the population for use in festivals and other ceremonies. In some cases, the priests have taken custody of the physical objects themselves, but that’s not always possible. Some shintai are large, heavy rocks that can’t be moved without equipment. There are 14 Shinto shrines within a 20-kilometer radius of the Fukushima plant and four more in the 20-30 kilometer belt. The situation is more difficult for those in the former group. Some priests left with just the clothes on their back, so they have no idea what shape the shrine itself is in, and some of them died or are still missing in the tsunami. Even those who were allowed to briefly return to their homes can’t go to the shrines because entry is restricted to residences. The shrine’s spring festival was held on April 19, but he was the only person to celebrate it. He said he prayed for everyone to return as quickly as possible. Let’s hope his prayers are answered. THE EARTH is still quaking in Tohoku—there was an M3 temblor there yesterday—but residents have rolled up their sleeves and started cleaning up. The Kahoku Shimpo, a daily newspaper published in Sendai, Miyagi, reported last week reported that work began in earnest on the 28th. One sentence in that report describes the extent of the destruction from another perspective: The prefectural government intends to remove all the debris within a year and to dispose of it within three years. They have their work cut out for them. In addition to clearing away the wrecked houses, they will also have to dispose of automobiles and equipment from plants in the maritime industry. They’re focusing their initial efforts on clearing roads for the passage of emergency vehicles. This will be a two-stage process. The debris will first be collected at several designated primary collection sites in each municipality. 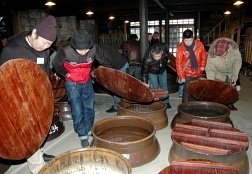 It will then be transferred to several larger secondary collection sites in the prefecture, where it will be crushed or burned. The final step is to recycle that which can be recycled. The prefecture estimates the volume of wreckage will total 18 million tons. That’s equivalent to the amount of debris handled by Miyagi in 23 years, and exceeds the 14 million tons of debris that was the fallout from the Hanshin earthquake. About 15 million tons of the junk is the result of the tsunami, and about 12 million tons of that is accounted for by wood frame houses. In normal circumstances, each municipality would be responsible for the work, but the prefecture is taking charge of this effort. The national government indicated it will assume the liability for most, if not all, of the costs. Among the debris are the remains of 23 JR railroad stations, as the English-language version of the Yomiuri Shimbun reported. JR East is still checking the damage to seven rail lines in Fukushima, Miyagi, Iwate and Aomori prefectures, and has found 680 places that need repair. The damaged sections are about 22 kilometers in length. The Joban Line suffered the most track damage, but the Kesennuma Line alone lost nine stations, including those at Shizukawa and Utatsu. That’s a lot of train stations, but readers familiar with local railroad lines in Japan know that some station buildings are smaller than houses. That wasn’t the case with the two specified here, however. 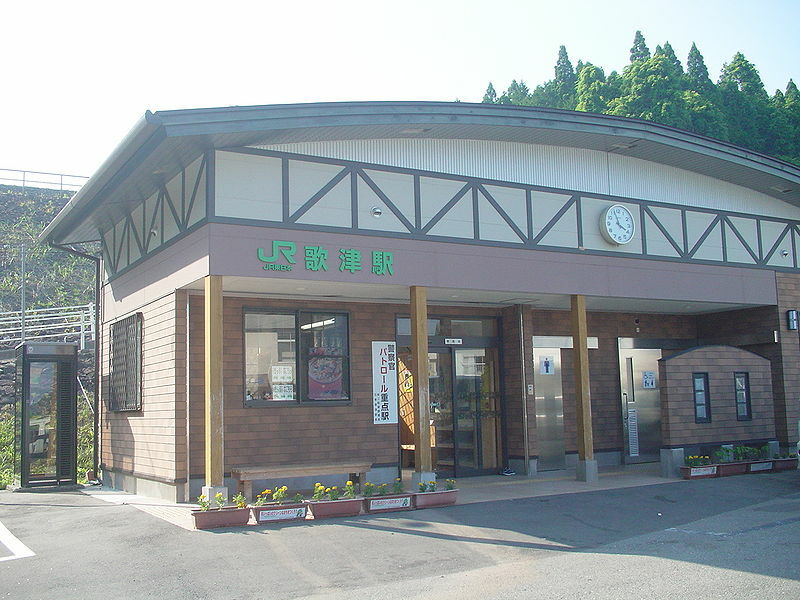 This is what the now non-existant Utatsu Station looked like before 11 March. Some aspects of the cleanup work are controversial, and no one will be surprised that the controversy is caused by the left-of-center DPJ government’s default position that the national government should be responsible for everything—including some pies it has no business sticking its fingers into. In this case, it is their approach for dealing with large areas of land that are expected to be abandoned for some time. They don’t explain how or why that would be so, because the only thing nationalization facilitates is the growth of government. It retards everything else. Finding temporary housing for people is one thing, but rebuilding entire communities is another. The details in the Japanese print media are sketchy—a word that best describes the DPJ’s policy conceptions for any issue—but one Japanese-language media source used the phrase “the restriction of land ownership rights” to describe the legislation being discussed. Sometimes absolutism is necessary, and this is one of those times. Any politician who would “restrict land ownership rights” for any reason should be permanently disqualified from public office. The now-abandoned land is owned by someone. If that someone is still alive, the disposition of that land is his responsibility. If that someone is no longer alive, he will have heirs, and the disposition of the land is their responsibility. If there are no heirs, the land can be sold at public auction. The potential exists for plenty of private sector solutions to the problem, but few good solutions exist to deal with the problem of governments that think limiting land ownership rights is part of their job description. Will a large-scale land purchase and rebuilding progam cause them to think about limiting other rights? I think not. The people committed to working in governments of that sort began with the premise of limiting personal rights before they got involved with politics as a career. Finally, someone might be cleaning up on Tokyo Electric Power Co. stock. The utility’s stock price plunged three straight days starting on the 28th, and reached the Tokyo Stock Exchange’s limit down level each of those days. On the third day a mystery investor stepped in. The price had fallen to JPY 466 as the close of trading approached on the 30th, and just at the close, someone forked over JPY 18.6 billion to buy 40 million shares. The price rebounded to JPY 524 yen the next morning, before settling into a range of JPY 500. In later trading it fell again to reach a low for the year of JPY 461. It finally closed at JPY 466, the same as the previous day. As the website J-Cast reports, market watchers naturally wondered who had all that scratch to spring for all that stock. The entity who owned 40 million shares of Tokyo Electric’s 1.6 billion shares outstanding would have 2.5% of the total. Had the owner maintained his stake on the 31st, the end of the business year, it would have been enough to rank him among the company’s major stockholders. The stock had been trading at roughly JPY 2,000 before the earthquake, and it took two weeks to fall to that low. It had been considered a blue chip stock, so speculators were attracted by the price swings. Had the new owners unloaded their stake when it reached a high of JPY 524 on the 31st, they would have walked away with JPY 2.3 billion. J-Cast notes that markets are always volatile after a disaster. Transactions on the First Section of the TSE exceeded JPY 2 trillion from March 14 to 18. Though the Nikkei share price index fell to the 8,000 level on the 31st, buying by bargain hunters drove it back up to roughly 9,700. One securities company analyst said the entire market was primed for trading by speculators and professionals, suggesting indirectly that individual investors should be careful. Mr. Edagawa thinks some twists and turns might still be in store for Tokyo Electric stock. While a sharp drop in TEPCO’s stock price was inevitable, market analysts think the reason it fell so low so precipitously at the end of the month was the government floating the dandy idea of taking an ownership stake in the utility. Here’s another absolute: When the ship of state docks at the Left Bank, rodents will scamper up the mooring lines and cracks will open in the hull. It’s time to invite Betty Wright to Northeast Japan. Wait for the line about Whitney Houston. MONDAY is the vernal equinox, the first day of spring and a public holiday in Japan. This year spring arrived 11 days after one of the five strongest earthquakes ever recorded and the resulting tsunami killed more than 20,000 people. That was followed by a seven-day period with 262 aftershocks of magnitude 5 or greater. It was fitting, then, that Monday’s news reports focused on renewal and recovery. Nissan Motors and Sony announced they will restart production this week, and gasoline production and deliveries in the Tohoku region began yesterday. Factories in Kyushu have been operating at full production for nearly a week, particularly in the energy (gasoline), food products, and pharmaceuticals sectors. Yamato has resumed express parcel delivery service in the three prefectures where the damage was the greatest. The website J-Cast reported that radiation readings in the capital region were declining, and were at normal levels at noon in Tokyo. More important, the SMBEs that are the backbone of all national economies have been picking themselves up off the floor. 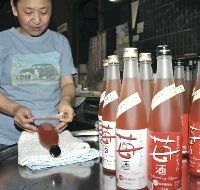 The Kisennuma, Miyagi sake brewery producing the well-known Fushimi Otokoyama brand got started on the final batch of winter last week. The company was founded in 1912, and their office building, which dates from 1980, was destroyed in the tsunami. The brewery itself, however, was intact, and it took only two people to get it running again. One of them has been sleeping in his car or in the brewery itself. In Iwanuma in the same prefecture, the employees of Iwanuma Seiko, a precision machining company, began cleaning up the premises. They have no electricity, the floor is buried in mud, and the only light is that which shines through the plant windows. A truck with relief supplies finally reached them on the 17th. Company President Chiba Kiyoshi was in Tokyo on a business trip when the earthquake and tsunami hit, but his wife responded quickly to the emergency and all 50 employees escaped harm. Meanwhile, in another time-space continuum, an article appeared in the Western media today with the following headline: “Rich Japan’s Descent into Misery Stuns”. I like this one better: “Bankrupt Media’s Descent into Irrelevance Stupefies”. 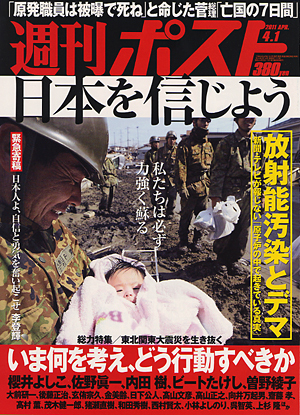 Neither Japanese language ability nor familiarity with the magazines’ content is needed to know which was published by the media outlet with the left wing political philosophy. It’s also worth noting that the yellow vertical headline at the right on the Shukan Post cover reads, “Radiation Contamination and False Rumors”. 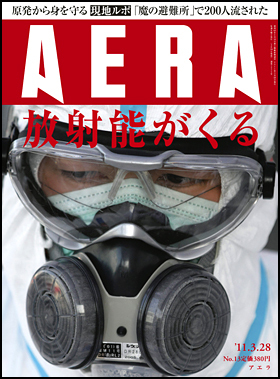 Aera’s publisher Asahi posted an apology on their website today for their choice of cover and headline. The plums are in bloom here in Kyushu. In another week or two, it will be cherry blossom season. Any day now, spring will be here for real, not just on the calendar. UPDATE: Can’t let this post by James Delingpole go by without mention. It’s titled, Whatever Happened to the Nuclear Meltdown? The Fukushima reactors actually came through the quake with flying colours despite the fact that it was five times stronger than they had been built to withstand. Only with the following tsunami – again, bigger than the design allowed for – did problems develop, and these problems seem likely to end in insignificant consequences….Other Japanese nuclear powerplants in the quake-stricken area, in fact, are sheltering homeless refugees in their buildings – which are some of the few in the region left standing at all, let alone with heating, water and other amenities. “Stopping nuclear energy is nothing less than rejecting the legacy of Einstein, Heisenberg, Bohr and all others. It is tantamount to scrapping it, labelling it as dangerous – all in a fit of ignorance. And just as creationists attempt to ban the theory of evolution from the school books, it almost seems as if every factual and neutral explanation in Germany is now in the process of being deleted. 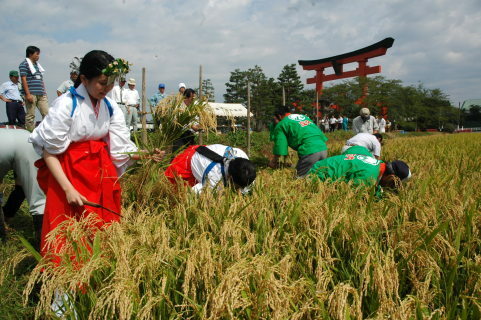 THIS POST last June briefly examined the importance of rice in Japan and included capsule summaries of the many rice-planting festivals held in late spring throughout the country. Now you know darn well that if people are going to take the trouble to have a special ceremony for planting the rice, they’re going to have another when it comes time to harvest it. And here they are! The ritual for cutting the rice itself is variously called the nuihosai, the nuibosai, or even the nuiboshiki, but they all mean the same thing. Some of the rice (and other crops) harvested during these ceremonies is offered to the divinities a month later in a ceremony called the niinamesai. Here’s a quick look at what’s been going on out in the fields. Don’t be shocked—some of it involves putting schoolgirls to work doing manual labor on the farms! Five junior high school girls clad as otome, or rice paddy maidens, hacked away during the nuihosai at the Kumano Hayatama Taisha, a Shinto shrine. The Shingu otome worked in a 10-are (quarter acre) wet paddy planted in April. The paddy yielded 480 kilograms of rice, which made everyone pleased as punch. The rice itself will be used for shrine ceremonies, while the ears were offered at the Ise shrine. 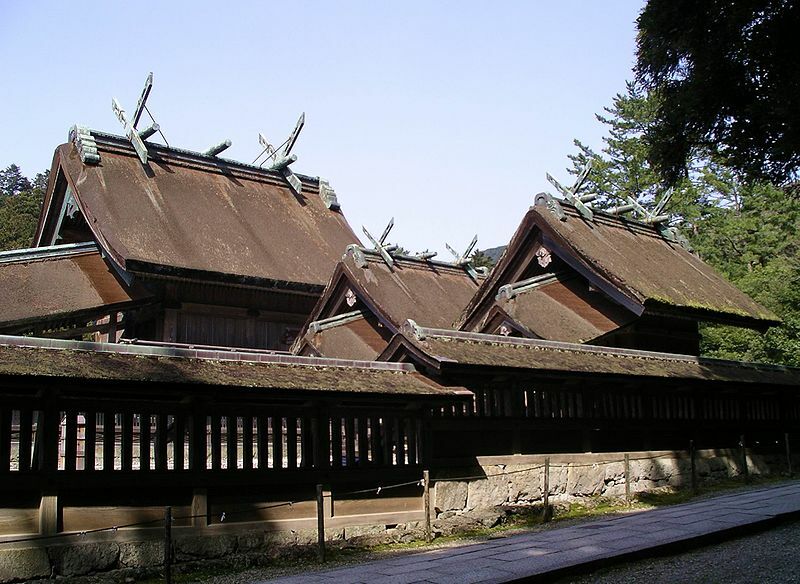 (That’s closely associated with the Imperial family, making it one of the most important Shinto shrines in Japan. The enshrined deity at the Inner Shrine is Amaterasu, the sun goddess who is the mythological ancestor of the emperors.) Teenaged Japanese girls don’t have a lot of practice at wielding the scythes, so the onlookers had to give them the benefit of their experience—whack from below and at an angle. That’s one thing about old folks—they like to stand around kibitzing. Here’s another—they’re usually right! Held at the O’asahiko Shinto shrine, this nuihosai started with a Shinto ceremony. Then five karime, or cutting girls, from the local primary school, went to work. Meanwhile, about 40 people watched from the sideline and gave the girls the benefit of their extensive experience. (Whack from below and at an angle!) 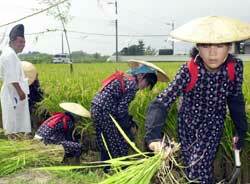 The rice was planted at the end of May, and the harvest totaled about 450 kilograms. It will be offered at the November niinamesai and to the shrine every day throughout the year. Instead of rice, the karime at this nuihosai harvested foxtail millet, a plant frequently cultivated in East Asia and infrequently seen in Japanese supermarkets. Millet can grow to a height of five feet, which might require different whacking techniques than those used for the smaller rice plants. A local farmer planted this small field in June. The crowd estimated at 170 who came to watch and make speeches included area residents and officials from the prefecture, city, and JA (the national agricultural cooperatives association). 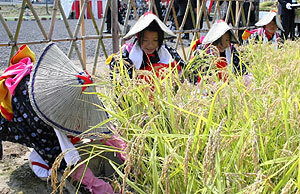 The millet will be dried and offered both to the Imperial household in Tokyo and at the local niinamesai. 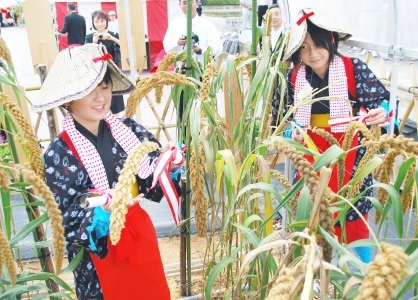 Fukui also harvests the traditional rice instead of millet, and that’s what the sixth-grade karime are doing here. You can’t see him, but helping out the girls is Ishikawa Tetsuji, who planted the field in May. 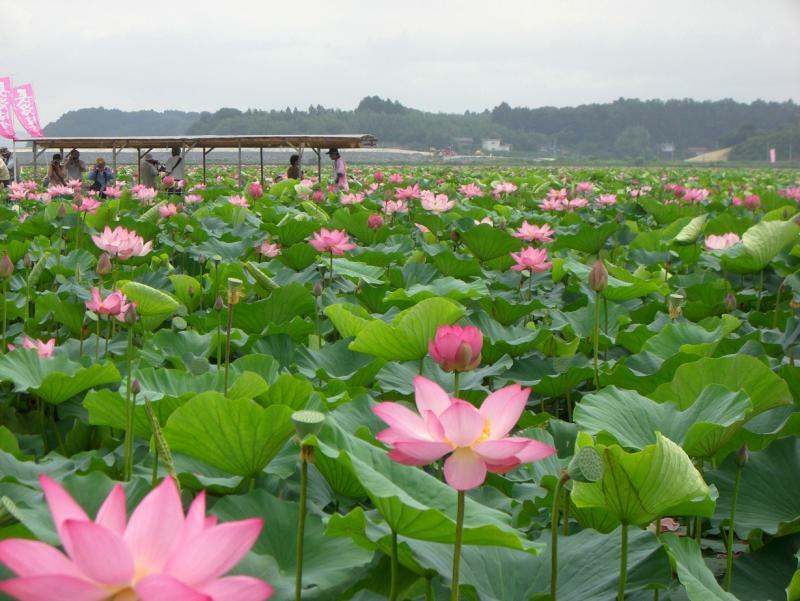 Mr. Ishikawa said that growing the rice in such a natural setting enabled him to derive a sense of spiritual culture. 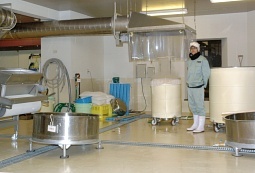 He said he also felt a particular responsibility because Fukui is the home of koshihikari rice. That’s a super-premium strain of rice created in the 1950s, and it has become one of the most popular in the country. It’s also popular at the Imperial Palace, where the crop was recently offered. It will be used later this month at the niinamesai with Fukui millet and other rice from around the country. The Imperial household is going to have enough rice to feed the entire diplomatic corps when these ceremonies are all over. Two liters of the rice harvested in Mine, Yamaguchi, which was cut by 15 karime, are also being shipped to Tokyo. 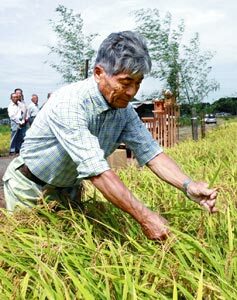 This year the job of planting the ceremonial crop fell to Kitahara Masahiko, which he did in May on his three-are (300 square meter) field. Mr. Kitahara allowed as how the great weather this year resulted in an excellent crop. Now when was the last time you heard any farmer anywhere talking up his harvest? The average farmer would rather choke on his cut plug than talk about how good he’s got it. It might make the government think twice about agricultural subsidies, for one thing. (The Japanese usually soft-pedal their good harvests by saying they are mazumazu, or not so bad.) He also said he was thrilled to do the work because it was the greatest honor that could be received in a lifetime of farming. They call it a nuiboshiki in Hamamatsu, and theirs was held at a rice paddy near the Iinoya-gu Shinto shrine, which every year grows isehikari rice received from the aforementioned Ise shrine. 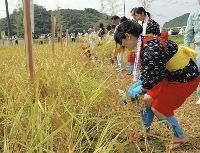 Eight grade-school girls dressed up as otome to harvest the rice they planted themselves in the spring, and they look like they’re enjoying themselves. A group of about 10 people stuck around to kibitz, telling them to whack from the bottom at an angle. The crop this year was about 100 kilos–sounds about right for grade school girls–which was dried for offering at the shrine. More was offered in mid-October at the Ise shrine itself at a ceremony called the kannamesai. Hey, where did that hair-legged guy come from! That’s Masuda Noboru, stomping around his own rice paddy in Omaezaki, where he planted koshihikari rice on 2,818 square meters in April. 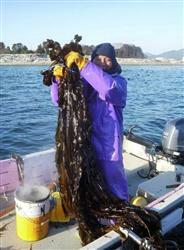 That yielded a harvest of about 500 kilograms—better than the usual crop, according to Mr. Masuda. He cut the rice plants himself for presentation to the tenno (Emperor) at the niinamesai. It’s a wonder the Imperial family doesn’t have a weight problem with all the food people send them from around the country. The Palace’s cut was 1.8 kilograms. According to the city government, this was the first time the ceremony was conducted in the municipality. Sometimes in Japan a centuries-old tradition can start just this year, and sometimes it can be a one-man operation. 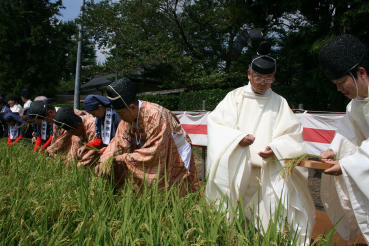 Iwanumanians use the term nuihoshiki to describe the ceremonial rice harvest at the Takekoma shrine, which dates from 842. The harvest was also a study session–about 50 Shinto priests went out to work in the fields, some of whom were shrine officials and priests from six prefectures throughout the Tohoku region taking part in religous training. A guy just can’t go out there and start hacking–you have to learn how to do this the right way first. (Whack from the bottom at an angle.) After the main priest ritually purified the paddy and offered a prayer, shrine officials and miko (shrine maidens) dressed as otome formed a row to cut the rice stalks. It’s a shame the miko weren’t closer to the camera. The priests bundled the rice and presented it to the divinities in thanks for the harvest. This year’s crop was said to be average, despite the heavy rains of late August. 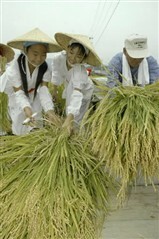 After the rice is dried in the sun, it will be offered at the niinamesai in late November. Nuihoshiki? Check. Rice paddy? 200 square meters. Niinamesai? Check. The local shrine’s cut? 1.8 liters. Growth time? Four and a half months. Yield? Pretty good, despite the lack of rain and the heat. Participants? 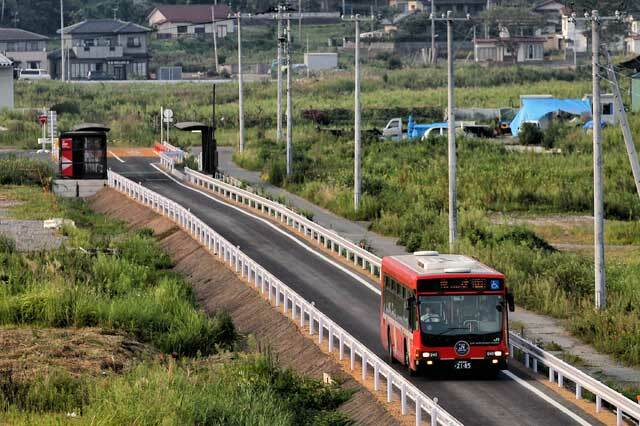 About 100, including city and prefectural government officials and 18 members of the farmer’s family. This one seems to have been a ceremony for the regular folks. I hope they’re not looking for a needle in the rice stacks. And here’s the Ise shrine’s own nuihoshiki, which this year was held in the rain. 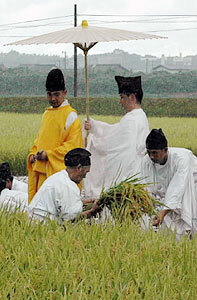 The rice was harvested by the priests from a shrine rice paddy in Kusube-cho. Those are some elegant threads and umbrellas for agricultural work. What’s the guy in yellow saying? “Whack from the bottom at an angle”? 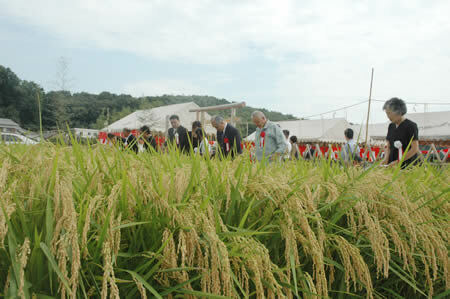 The event is a statement for self-sufficiency, as the rice grown and harvested here will be used for events at the shrine. Participating in the event were about 80 people, including shrine officials and area residents. After the initial prayer, they entered the paddy to cut the rice with sacred scythes. Don’t you wish you had a sacred scythe, too? The rice was separated into two groups, one for use in the Inner Shrine and one for use in the Outer Shrine. It was then stored after inspection by lower ranking priests, called negi. Both ordinary rice and the more glutinous mochi rice were grown in the paddy. 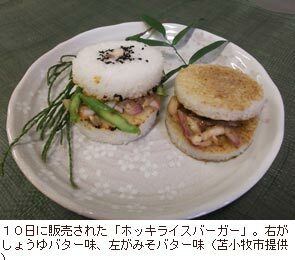 (The latter variety is used to make the rice cakes for New Year’s decorations.) About 240 bags were harvested, and the first offering will be at an event called the kannamesai on 15 October. Those ladies look like they’re having fun. Maybe they’re playing Tom Sawyer and trying to con us into painting the fence. That’s the nuiboshiki in a consecrated paddy at the Yutoku Inari Shinto shrine in Kashima to give thanks for the fall harvest. 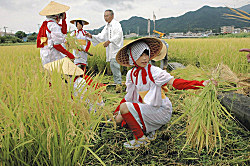 The miko, clad as otome, formed a horizontal row to cut the rice plants. This traditional ceremony gathers the rice used for the niinamesai on 8 December and is more than 300 years old. To start, 11 miko perform a solemn dance at the shrine in supplication for a big harvest. Then three miko use flutes and percussion to perform a song for an abundant year while the other eight go to work with a scythe. The harvest was better than average, and the priest was glad there was no typhoon damage. 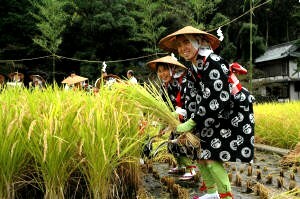 The shrine’s rice planting ceremony was covered in the June post, and the miko wore the same clothes then. And then washed them for this ceremony, of course. And with that, the granaries are filled for the winter! HOW DO THE JAPANESE SPEND CHRISTMAS? The best way to answer that is to let the Japanese answer themselves, and the good news is they already have—through surveys. A group called Work-Life conducted one such survey from 19-22 November. The survey subjects were 891 men and women from the ages of 20-59. Here are the questions and their answers. Q: Do you feel Christmas is a special day? The group with the highest percentage of affirmative answers were those in their twenties at 66.5％. Interest in the holiday declined with age, and fell to 36% for people in their 50s. Q: How do you plan to spend the day? Q: For those who plan to relax at home and those who plan to have a party at home, what sort of meals will you eat? Broken down by age group, 80% of people in their 20s say they will use home meal replacements. The incidence of this answer trends downward as the respondent’s age increases. Conversely, the older people get, the more likely they are to make their own dinner at home. Q: How does this compare to last year’s expenditures? 74.6% replied there would be no change. Fewer than 10% of the people in their 40s or 50s said they would spend more or slightly more, but slightly fewer than 30% of those in their 20s and 30s planned to spend more. Thus, younger people plan on having a more elaborate Christmas celebration. Q: For those going out to dinner, what type of establishment will you visit? 68.9% said a restaurant, followed by 15.9% who answered an izakaya （a traditional Japanese eating and drinking place). Q: How much will you spend at these establishments? 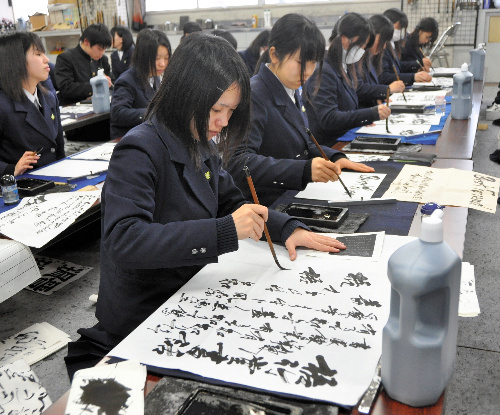 Only 5% of the respondents said more than 30,000 yen (US$265.00), and 65.9% said less than 10,000 yen ($88.00). The survey group concluded that people aren’t splurging as they did during the bubble economy days, despite Japan’s brightening economic picture. What would Christmas be without presents? A survey conducted by Japan.Internet.Com and goo research uncovered some information on Japanese attitudes towards Christmas gifts. Those surveyed were 1,089 Internet users from their teens to 60 and older. 53.35% were men and 46.65% were women. Q: Do you plan to give a Christmas present? 44.9% of the respondents said yes and 20.11% said they were thinking about it. 34.99% said no. Q: To whom will you give a present? Q: Where will you buy the presents? 82.41% said brick-and-mortar stores, and 28.83% said an Internet shop. Those are interesting results for an Internet survey. Just 7.36% said they would give something homemade, and 2.86% said they would give something they already had on hand. Q: How much money will you spend? 38.24% said between 1,000 (US$8.83) and 5,000 yen, and 31.90% said from 5,000 to 10,000 yen. Q: What will you buy as presents? The reply from 30.47％ was clothing, 17.38％ said confections, 17.18％ said game software, and 15.75％ said jewelry. In fifth place was “others”, with 14.72％. When those giving “others” as an answer were asked to specify what they would buy, most said toys. Q: What would you like to receive as a present? 14.97％ hoped for jewelry, while 13.59％ wanted clothing, and 11.75％ said gift certificates. Yet another survey found that about 90% of all children would receive Christmas presents. (That corresponds with the answers I got in an informal discussion of this question with the students of two college classes I taught in the spring. Finally, for the sake of comparison, let’s look at some answers from an Internet survey last January conducted by My Voice Communications. They had 10,000 respondents. 25.8% said they had a party at home. More than 20% prepared Christmas dinner at home. 26% said they did nothing special. 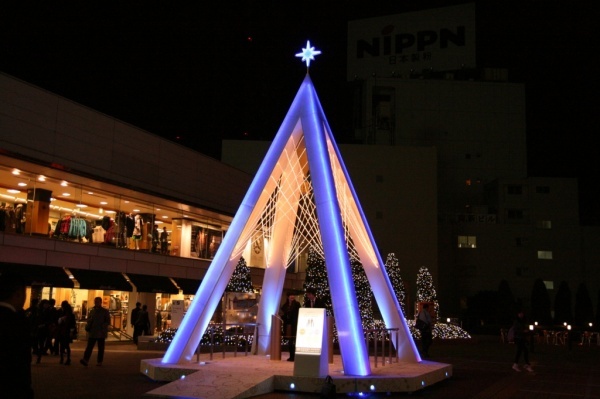 We’ve seen before that the Japanese have an imaginative approach toward Christmas trees. Here’s a word about the two trees in the photos accompanying this post. The first one is probably unlike any in a Western country. Located in Shiogama, Miyagi Prefecture, it is made of 30 tairyobata, or banners hung by fishing boats to signal a large catch of fish. 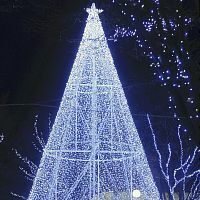 A crew of 15 hung a fishing net arranged to look like a tree on the side of a wall 17 meters high on a square near the harbor and decorated it with lights. They also stretched rope down from the roof and attached the banners so that they hung in a triangular tree shape. 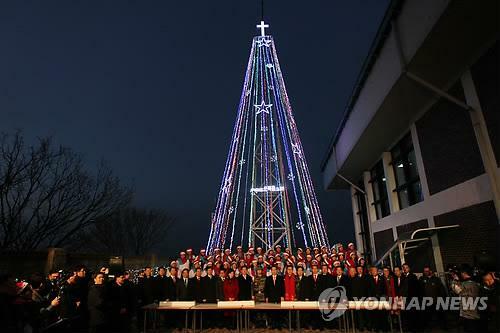 The tree, which was first erected last year, will be lit from 5:00 p.m. to 10:00 p.m. until the 31st. The second tree is on a traffic circle in front of the Entetsu Railroad’s Hamakita Station in Hamamatsu, Shizuoka Prefecture. It will be lit every day from 5:00 to 11:00 p.m. until 15 January. The tree has roughly 9,000 LEDs that are used for illumination. There are also lights resembling snow crystals and stars decorating a nearby mural, as well as 40 other illuminated trees in the area.